I've miss all of you!! Don't think for a minute I haven't been plagued with guilt everyday for not getting to blog sooner. Hesitant to sound like a broken record, I really have been crazy busy since I've returned home. It was like that for weeks before market, and if market was successful, it's like that afterward as well. Paula and I were there minus a partner for Paula (not allowed anymore, Mary Ellen!) and helping friends for me, so I didn't have very much time to wander the show to say hi and visit with many people, so this time, I'm afraid I don't have many pictures to share beyond those people who were in my aisle. This was the first time Treenware & Berries went to the Big Show. Could not have been happier over the response I received!! 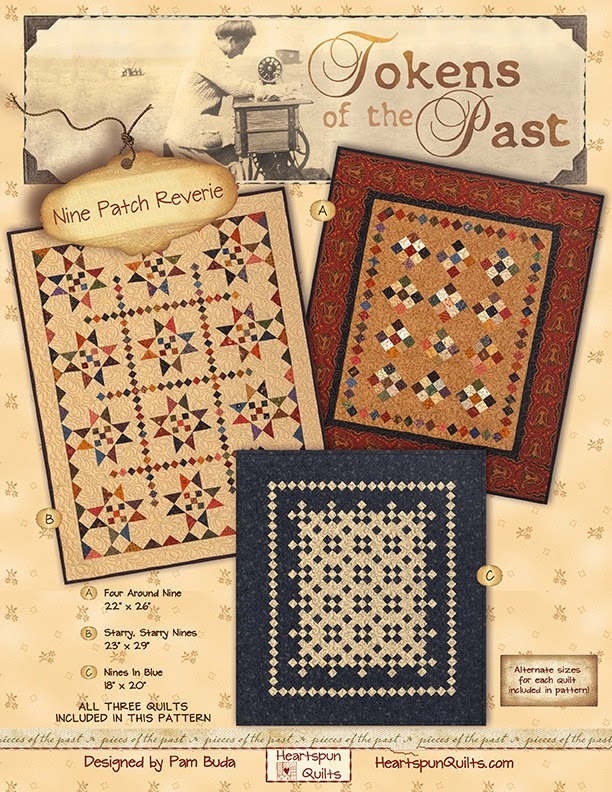 The Tokens of the Past: Nine Patch Reverie quilts were hot sellers for me! I was over the moon happy about that. You never know. 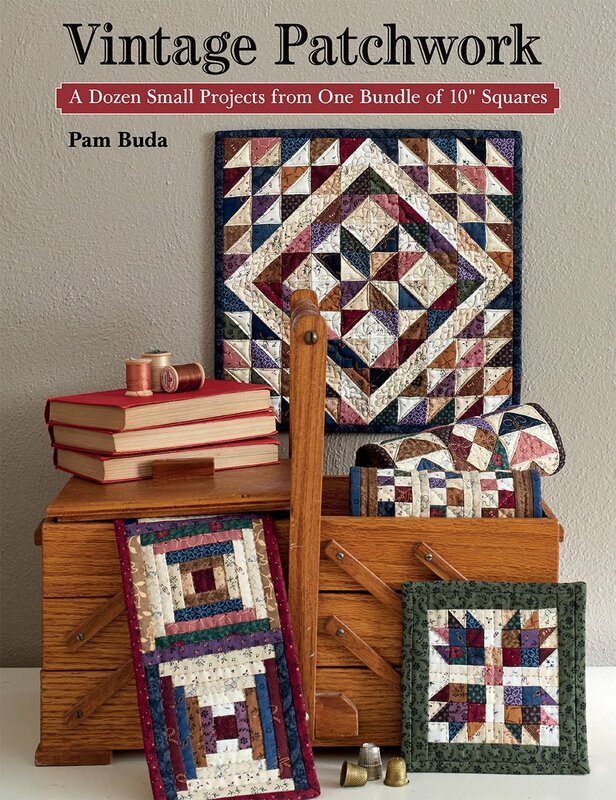 Quilters and shop owners alike loved that you can make the quilts in a number of different ways and sizes. I am very grateful for the positive response. In my next post, I'll show other designers booths and their beautiful work. Off to make dinner...but I'll be back soon. I promise it won't take me so long to write the next post!! 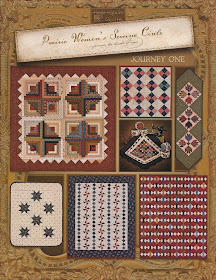 Welcome to Month Five of A Prairie Gathering Quilt of the Quarter program!! ...and more Shoo Fly blocks. 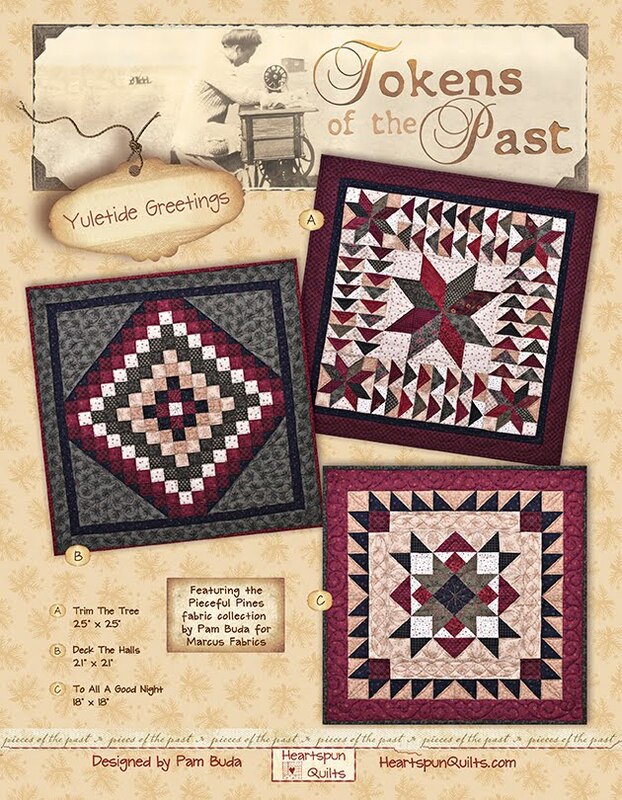 The only thing you're not making this month are the four Flying Geese border cornerposts. Click here to see all of my hints from last month's post. Hang in there with me!! Come border assembly time, you'll be so happy you took your time and prepared all this piecing. It's soooo worth it! Introducing Tokens of the Past: Nine Patch Reverie!! I love when something I've been working on is finally ready for the big reveal!! 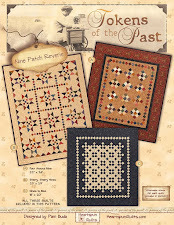 I'm so, so pleased to announce the introduction of my newest Tokens of the Past pattern, called Nine Patch Reverie!! 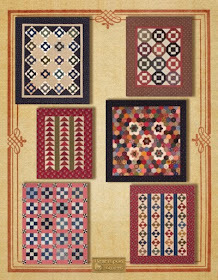 I'm lovin' me a Nine Patch block, and I've been thinking about this pattern for awhile. 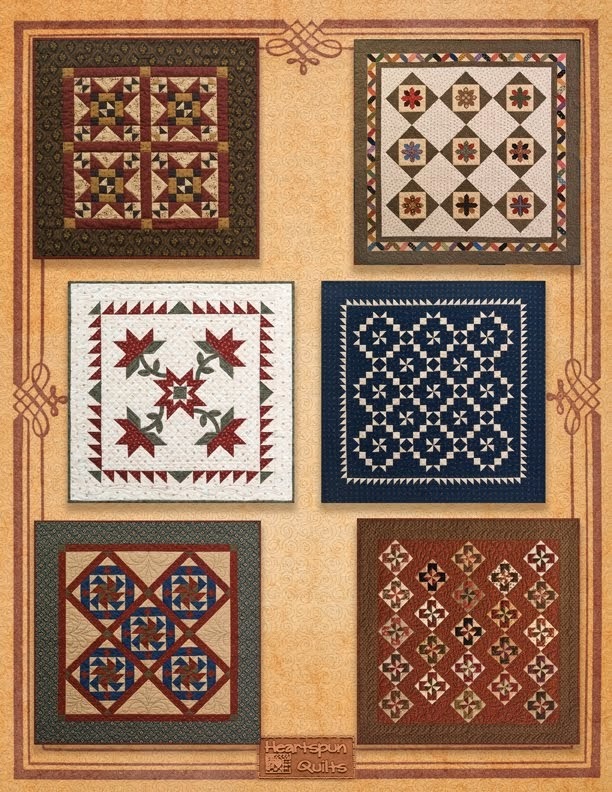 While I love a simple, traditional Nine Patch quilt, there's a lot of plain, classic patterns out there, and you certainly don't need another. I set out to design three quilts, all using Nine Patch blocks, all different from one another, and different from what's already been done. I hope you like them!! 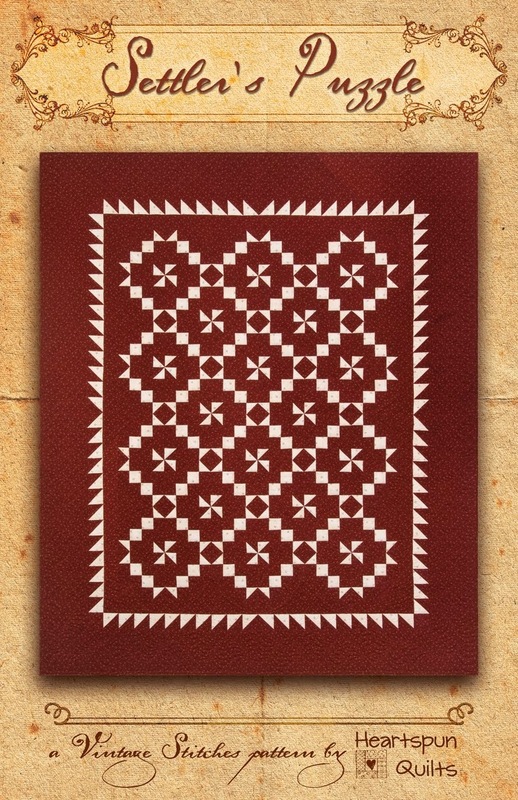 One important thing you need to know is there are larger, alternate sizes for each quilt included in the pattern. First up is Four Around Nine. Simple Nines surrounded by simple Four Patches. The Nine Patches are front and center, framed by a lovely red print border. The size of the finished block in this, the smallest one, is 4 inches, with the quilt measuring 22" x 26". 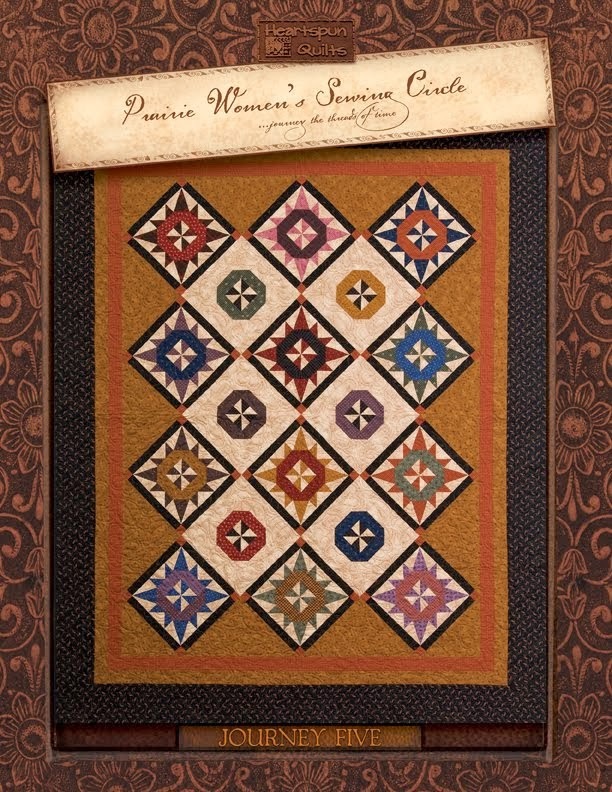 The larger, alternate size has a finished block of 6 inches, with the quilt measuring 34" x 40". Second is Starry, Starry Nines. I am madly in love with this quilt. 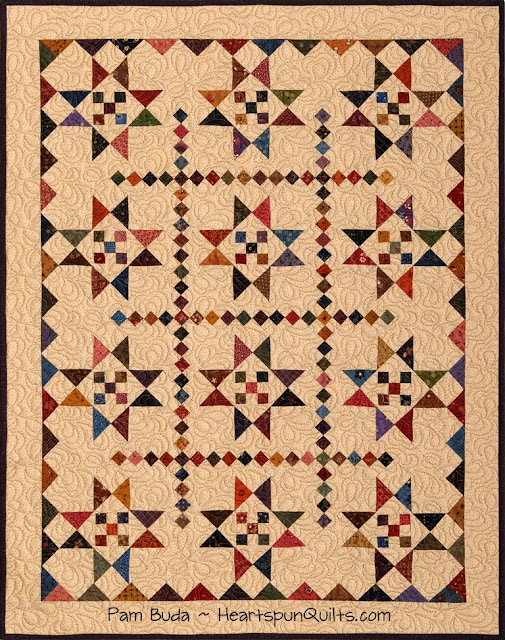 Double Nine patch blocks create this fun center "grid" where Sawtooth Stars with more Nine Patches float, surrounded by a fun to piece sawtooth border. Scrappy, too!! Love, love. The size of the finished block in this one is 4 1/2 (which means those Nine Patches are 1 1/2), with the quilt measuring 23" x 29". Now, because of that Sawtooth border....the math just didn't work for any other size except to double the size of the blocks, which of course doubled the size of the quilt. 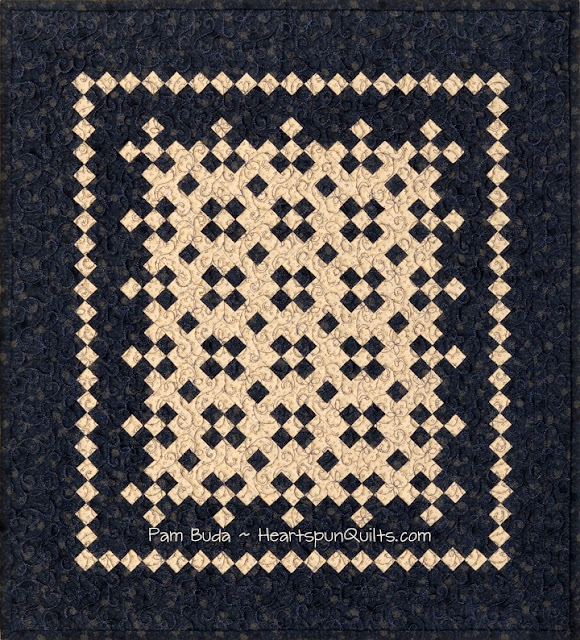 So, the next largest size has blocks finishing to 9 inches, with the quilt measuring 51" x 64". A yummy lap/throw size. Here you can see them both together. Isn't it fun to see?!! They were a whole lotta fun to piece. Lastly, I give you Nines In Blue. 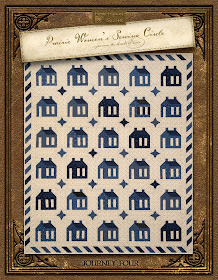 This collection of different Nine Patches play with the light and blue fabric to make this cutie pahtooty little quilt! 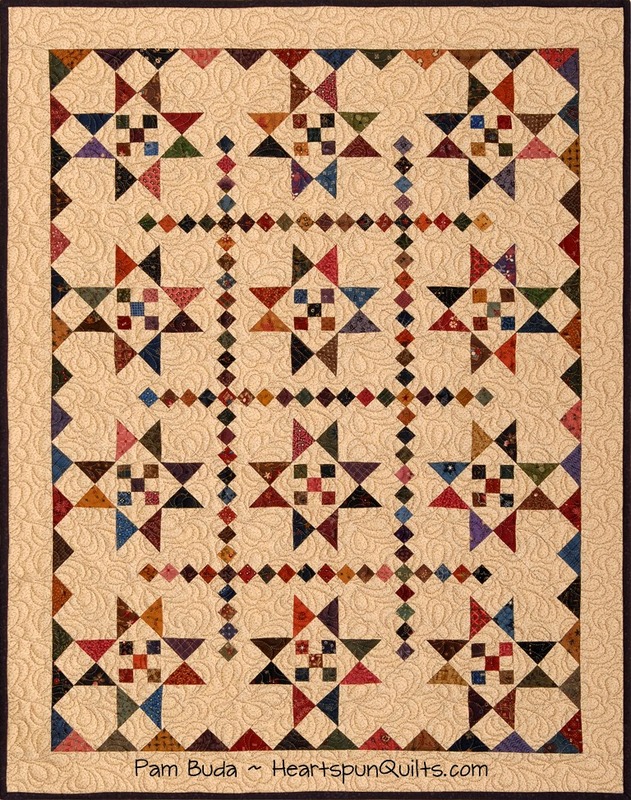 I had some fun with alternates for this quilt, and I'll show you what I mean in a moment. 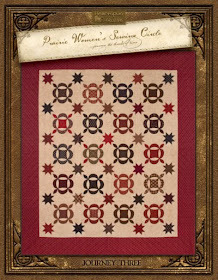 The size of the finished block, for this the smallest quilt, is 1 1/2 inches, with the quilt measuring 18" x 20". Soooo little, and sooo cute! Here's a photo of just what I mean about playing with this design. 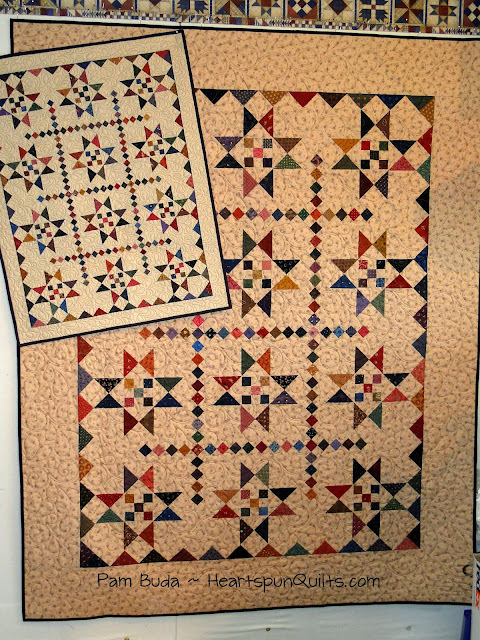 The quilt at the right is the same Nines In Blue quilt, double the size, and with the light fabric replacing the blue background, and I changed the squares to all scrappy darks. Kinda fun...what do you think?? 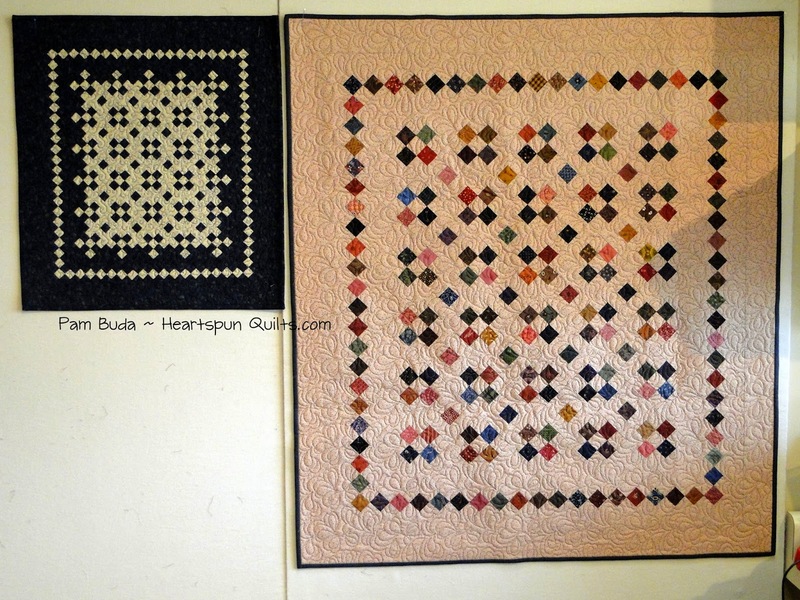 The quilt to the right is the next larger size, with finished blocks measuring 3 inches, and the quilt measuring 34 1/2" x 39". There is yet another, largest size for Nines In Blue with a block size of 4 1/2, with the quilt measuring 23" x 29". They're all versatile, fun, and easy. All have our favorite Nine Patch block. I hope they pique your interest! 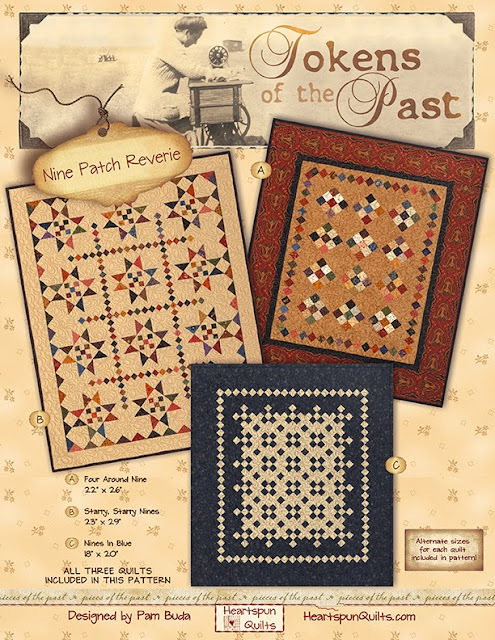 Click here to order the Tokens of the Past: Nine Patch Reverie pattern today! I'm off to quilt market in Minneapolis for the week. If you order a pattern, it will ship while I'm gone. 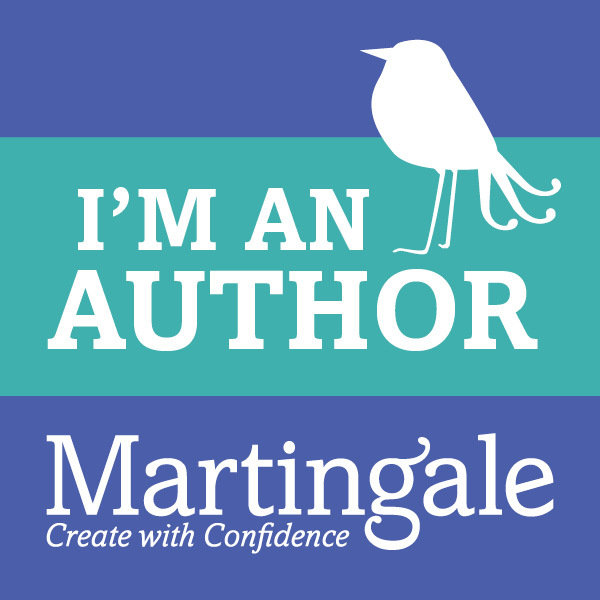 I won't be posting on my blog again until I get back home, but I will try to post regularly to Instagram and Facebook, so I invite you to follow me there. Until then, I hope you find some time to enjoy yourself and sew awhile. Gee, I've missed writing to you, but there hasn't been much to say of interest while I've been getting everything ready for quilt market, which is next week!! AAHHH!!! My friend Deb and I have been cutting what seems like a million scraps for five new quilts, and we've been keeping our friend, Ronda, very busy quilting them all. Lots of cutting, sewing and quilting, but oh...the quilts are just turning out great! I'm so excited. 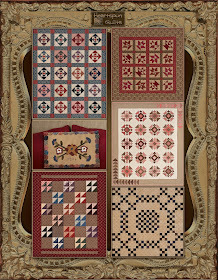 All five quilts are for my newest Tokens of the Past pattern called Nine Patch Reverie. I've been wanting to create this pattern for a few years now, and finally, the time is right! It's been worth the wait. There's still so much to do to get ready, but I really wanted to sit and touch base with all of you before any more time got away. I can show you a few sneak peek pictures of the three quilts, but don't want to announce the pattern showing the full quilts until all five are here and ready. That will likely be early next week....so please, stay tuned. 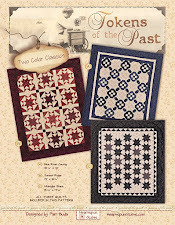 There are three new quilt designs. All use our favorite, classic block....the Nine Patch. 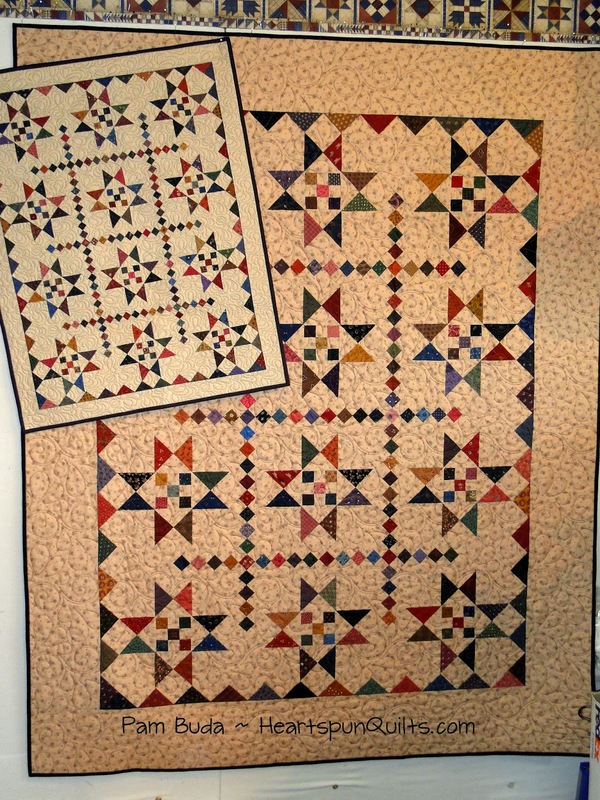 All three quilt designs can be made using larger pieces, making larger blocks, and quilts!! Some have three alternate sizes!!! All included in one new, wonderful pattern. Nine Patch Reverie is not linked to a 10" precut. You pick and choose all your own fabrics. 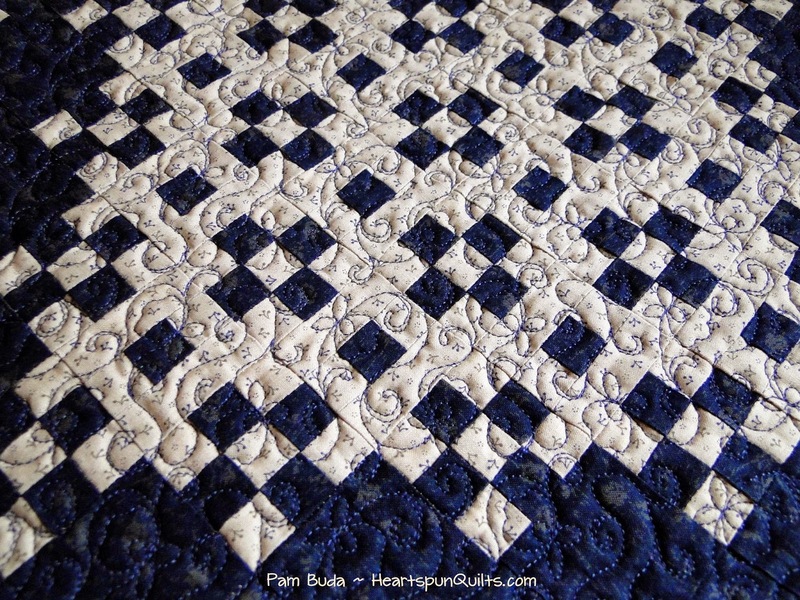 The first quilt is called Nines in Blue. 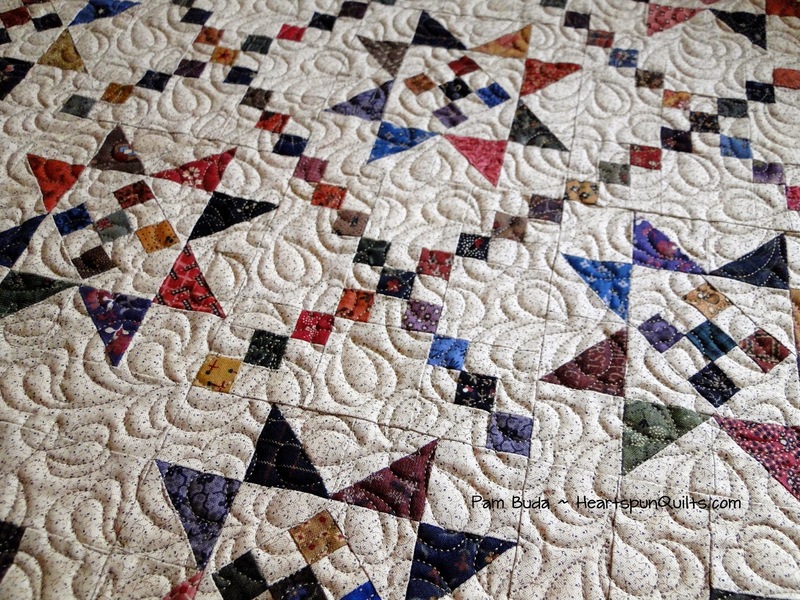 There are directions to make this quilt is two colorways and three different sizes! 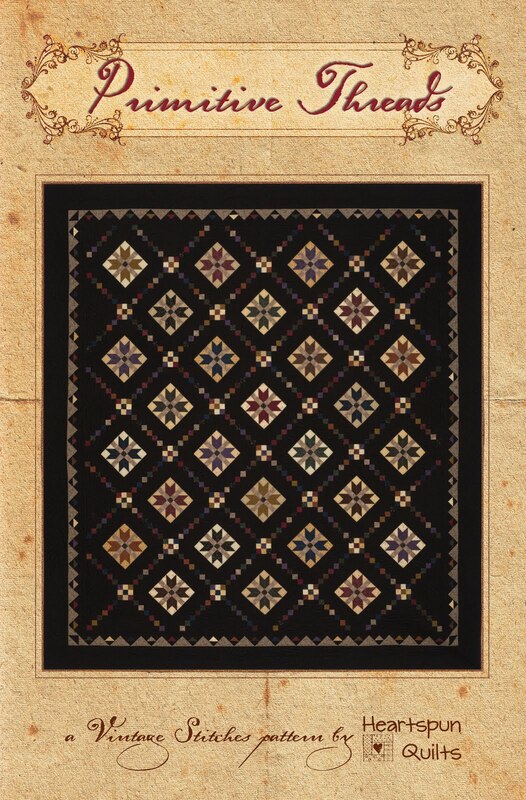 The second quilt is called Starry, Starry Nines. 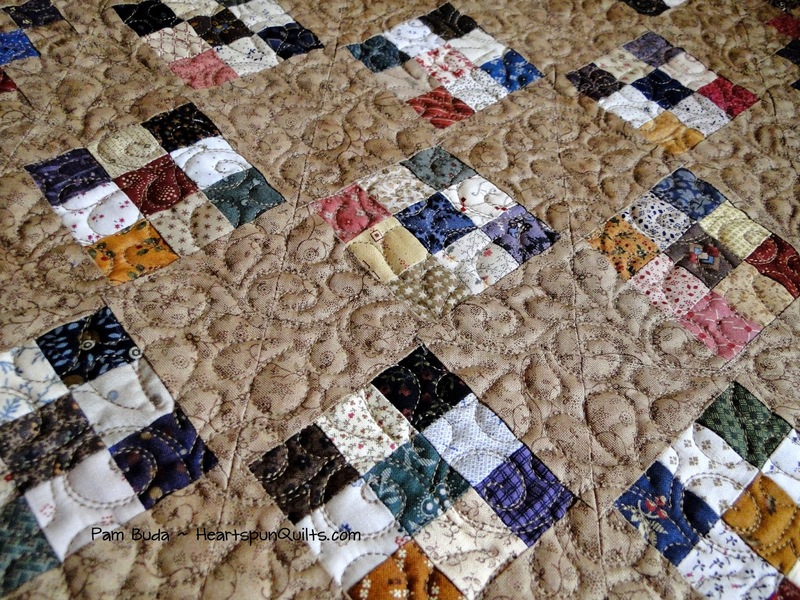 Super scrappy and several fun to piece blocks with a great border. 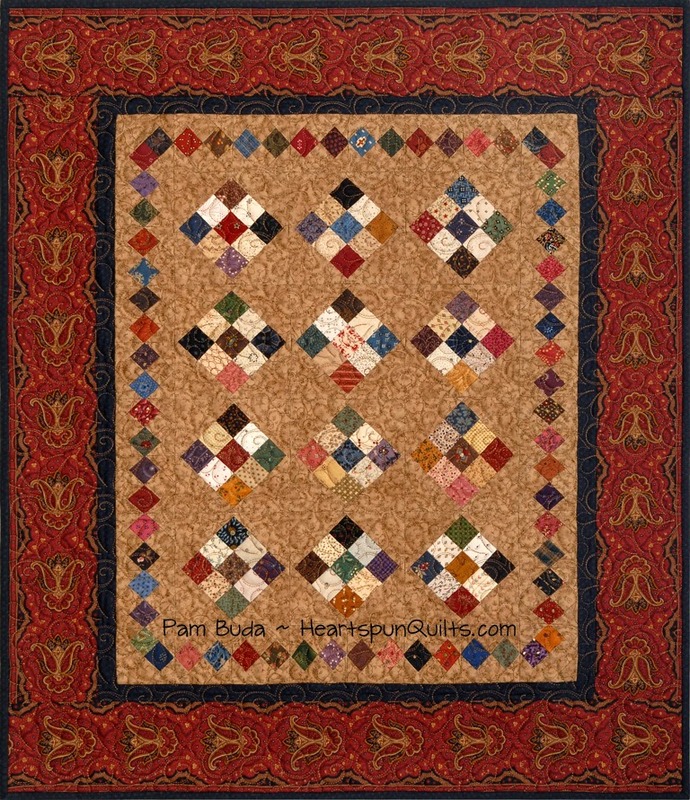 This quilt comes in two sizes....a wall hanging and a throw. 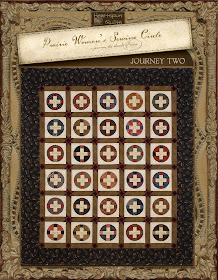 The third quilt is called Four Around Nine where the Nine Patch center is surrounded by Four Patch blocks. 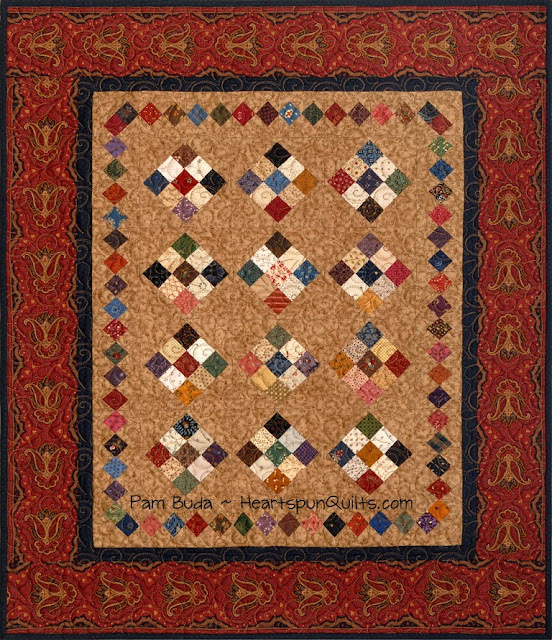 You can make this quilt in two sizes as a wall hanging. My to-do list just seems to keep growing, so I'd better get back to work. I hope you don't give up on me. New goodies are coming! 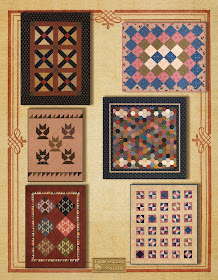 New fabric collections, new quilts, and yes...a new kind of sew-along. I'll catch my breath one of these days. 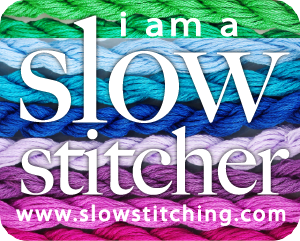 I'll be back here soon....and I sure hope you're finding some time to stitch. I'm just doing a whole lotta math! !